Ecological climatology is an interdisciplinary framework to understand the functioning of terrestrial ecosystems in the Earth system. It examines the physical, chemical, and biological processes by which ecosystems affect and are affected by climate. The central theme is that terrestrial ecosystems, through their cycling of energy, water, chemical elements, and trace gases, are important determinants of climate. The coupling between climate and vegetation is explored at spatial scales from plant cells to global vegetation geography and at timescales of near instantaneous leaf gas exchange to millennia climate change. Natural vegetation dynamics and human land use are shown to be important mechanisms of climate change. The boreal forest-tundra ecotone and the North African Sahel are examples of climate-ecosystem dynamics. Deforestation, desertification of drylands, cultivation of grasslands, reforestation following farm abandonment, afforestation, and urbanization are case studies of how human uses of land alter climate. The book is written as an introductory textbook for graduate students and advanced undergraduates. It reviews the key scientific concepts, the field observations that support these concepts, and climate model applications that show the impact of vegetation on climate. To aid professors in lectures and to help students understand concepts, the book contains 440 illustrations, many in color, and 322 review questions. Each chapter begins with a chapter summary that provides readers a quick overview and an understanding of how the various chapters relate to one another. Each chapter includes review questions to aid students in their understanding and to allow them to monitor their comprehension of the material. Each chapter also contains a bibliography of the relevant literature, with some 2,000 scientific studies cited in a state-of-the-art scientific review. 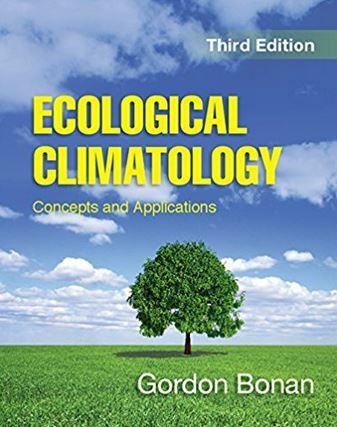 The book describes Earth's climate, the processes shaping climate, how climate changes over time, and the manner in which terrestrial ecosystems influence climate. It is divided into six sections on the Earth system, global physical climatology, hydrometeorology, biometeorology, terrestrial plant ecology, and terrestrial forcings and feedbacks. The first section describes component spheres of the Earth system (Chapter 2) and the energy, water, and biogeochemical cycles that link these spheres (Chapter 3). The second section reviews climate, climate variability, and climate change. The radiative balance of the atmosphere, its geographic variation, and its annual cycle are an important determinant of climate (Chapter 4). Geographic and seasonal variation in the radiative balance drives the general circulation of the atmosphere (Chapter 5). This gives rise to Earth's macroclimates, and within which mountains, lakes, and vegetation create local climates (Chapter 6). The realized temperature and precipitation in any year can deviate markedly from the long-term climatology because of seasonal-to-interannual atmospheric variability such as the El Nino-Southern Oscillation and North Atlantic Oscillation (Chapter 7). Climate also changes over longer timescales of centuries and millennia in response to changes in insolation, greenhouse gases, and numerous feedbacks within the Earth system (Chapter 8). The third section on hydrometeorology reviews the hydrologic cycle, surface energy fluxes, and the interactions between the hydrosphere and atmosphere. Soils store vast amounts of energy and water, and this modulates the diurnal and annual cycle of temperature, provides water for evapotranspiration, and regulates the hydrologic cycle on land (Chapter 9). The hydrologic cycle on land is reviewed in terms of point processes (Chapter 10) and watershed processes (Chapter 11). The hydrologic cycle regulates surface energy fluxes. The energy balance at Earth's land surface requires that energy gained from net radiation be balanced by the fluxes of sensible and latent heat to the atmosphere and the storage of heat in soil (Chapter 12). The fluxes of sensible and latent heat occur because turbulent mixing of air transports heat and moisture, typically away from the surface (Chapter 13). Soil moisture exerts a strong control on the partitioning of net radiation into sensible and latent heat fluxes, and through this affects the atmospheric boundary layer (Chapter 14). The fourth section reviews biometeorology. The exchanges of sensible heat, latent heat, and CO2 between land and atmosphere are regulated by the physiology and micrometeorology of plant canopies. Individual leaves absorb radiation and exchange sensible heat and latent heat with the surrounding air (Chapter 15). The uptake of CO2 during photosynthesis is tightly coupled to the loss of water during transpiration (Chapter 16). Both occur through stomatal openings on the leaf surface. The aggregate flux from vegetation is the integral of the individual leaf fluxes over the depth of the canopy (Chapter 17). The fifth section reviews terrestrial plant ecology. It extends the discussion of plant physiology from the previous section to an overview of whole-plant allocation and plant strategies (Chapter 18), the arrangement of plant species into populations and communities (Chapter 19), and the functioning of ecosystems (Chapter 20). The weathering of rocks, the decomposition of soil organic material, and soil formation are part of the biogeochemical cycling of carbon, nitrogen, and other elements among the atmosphere, biosphere, and geosphere (Chapter 21). Vegetation changes over time in response to recurring disturbance (Chapter 22). Landscapes represent another level of ecological organization, merging the concepts of populations, communities, ecosystems, and plant dynamics. Spatial gradients in the environment combine with natural and anthropogenic disturbances to create a mosaic of plant communities and ecosystems across the landscape (Chapter 23). The structure and composition of vegetation and the functioning of terrestrial ecosystems, which at a local scale are shaped by environmental factors such as temperature and moisture, are also influenced by global climate. This is seen in the biogeography of vegetation and in the global carbon cycle, especially net primary production (Chapter 24). The final section examines terrestrial forcings and feedbacks in the Earth system, especially how natural and human changes in land cover and land use affect climate. Numerous global climate model experiments have demonstrated the role of land surface hydrology and terrestrial vegetation in determining regional and global climate. Chapter 25 reviews the representation of land surface processes in global models. Soil moisture, snow, and vegetation contribute to climate variability (Chapter 26). Vegetation dynamics in response to climate change alters climate by changing surface albedo, net radiation, and evapotranspiration. The boreal forest-tundra ecotone and the Sahel of North Africa are prominent examples of coupled climate-vegetation dynamics (Chapter 27). Deforestation, reforestation, degradation of drylands, and cultivation of croplands are case studies of how human uses of land alter climate through biogeophysical processes (Chapter 28). In addition, terrestrial ecosystems are coupled to climate through various biogeochemical cycles. The carbon cycle is a prominent feedback with climate change (Chapter 29), as are reactive nitrogen (Chapter 30) and aerosols (Chapter 31). Urbanization also alters climate and the hydrologic cycle (Chapter 32). Because terrestrial ecosystems have such a significant impact on climate through albedo, evapotranspiration, carbon storage, and other processes, they can be managed to mitigate the undesirable effects of anthropogenic climate change (Chapter 33). Greater understanding of Earth and its climate requires that all components of the Earth system - physical, chemical, biological, and socioeconomic - be considered. Terrestrial ecosystems - nature's technology - are a critical aspect of planetary habitability in an ever increasing technological world (Chapter 34). Gordon Bonan is a scientist in the Climate and Global Dynamics Laboratory (CGD) at the National Center for Atmospheric Research (NCAR). He is head of the Terrestrial Sciences Section.